Is Italy a good place to retire? If you want to retire in Tuscany, this article provides an excellent analysis of the pros and cons, and offers some general advice about choosing a retirement location that’s right for you. Relaxing by your pool, sipping on a glass of Chianti, as the warm sun goes down over your very own centuries old Tuscan farmhouse set in the middle of an olive grove – you've got to admit it does sound tempting – “La Dolce Vita” and all that goes with it – sun, great food and wine, sun, lazy relaxed living, more sun. But is Tuscany really a great place to retire in Italy, or is this just the misty eyed version of TV pasta commercials? 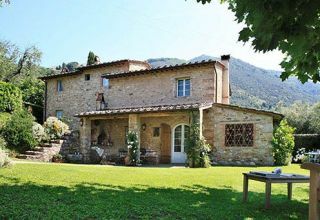 Jim Andrew, co owner of a villa rental website, Rent a Villa in Tuscany , has lived there for over 20 years now, let’s hear from him if Tuscany ticks the boxes as a retirement destination. LIFE STYLE – Cost of living is getting more expensive, but probably about the same as the UK or Ireland. Lots of locals still have a vegetable patch. It’s good exercise, good for you, and saves you money! I’d say Italians in general have quite a “civilised” lifestyle – seaside in the summer, skiing in the mountains in winter. They are very sociable people, although meeting friends for a pizza is more the thing. Pubs are few and far between and alcohol doesn't play a big part in most people’s social life. WHERE TO Retire in Tuscany– Although Tuscany has the reputation of being a bit up market and expensive and certain areas will cost you an arm and a leg, with a bit of homework it’s still possible to find property to buy at great prices, especially if you live slightly outside the main tourist areas. Also worth noting that although everyone’s image of Tuscany is rolling hills and vineyards, Tuscany is actually quite varied – everything from mountain tops to coastal resorts to medieval city centres to countryside villages, and yes there are hilltop stone farmhouses with vineyards and olive groves too! STYLE OF HOUSE – If you are into DIY then you might relish the idea of a renovation project when you retire. However, without good local contacts and a good level of Italian it’s not something to be taken on lightly. Another possibility is to buy a farmhouse which has already been renovated by a foreigner. On the other hand the quality of Italian new builds is good and it leaves time for relaxing. You choose! LEARN THE LANGUAGE – There are some countries where the expatriate community is big enough to allow you to get by without learning the local language (Spain and Cyprus come to mind) but in Tuscany, outside of the main cities you really need to get to grips with Italian. There are a few expat groups who meet in Florence but you really want to be able to communicate with your neighbours, tradesmen, shopkeepers etc. There are lessons online and classes locally. TRY IT FIRST – Before committing to a certain area, try it out at different times of the year. The beach town may be great in summer but a deserted, ghost town the rest of the year. The panoramic mountain view might not seem so good in mid winter. The place you visited as a tourist might be too busy as a place to actually live. DISTANCES- Countryside living can mean a long journey to any services, shops etc, a city apartment means most things on your doorstep – privacy or convenience? Distance from family and friends back home – not a problem as Tuscany is only a couple of hours or so from the UK. Tuscany’s main airports are Pisa and Florence, although there are other choices such as Bologna, Rome, Forli etc. The budget airlines fly into Tuscany, but remember timetables are cut back in winter. THINGS YOU MISS - Although it’s not exactly going to be like living in the African bush, there are some things that you just don’t get - bacon and eggs for breakfast, fish and chip shops, a round of golf, a pint at the local, an Indian takeaway. I’m not saying these are impossible, but very nearly. Depends how important these little things from home are, get friends to bring supplies or visit Richmond’s English food shop in Viareggio. SECURITY – Although it’s always worth taking sensible precautions in any country, I’d still say Tuscany is a safe place. I've never felt threatened anywhere here. It’s not an alcohol based social scene so it’s not dangerous when it’s closing time. HEALTHCARE – As always you’ll hear nightmare stories, but my experience of Italian healthcare is good, I've found it efficient, professional and the hospitals I've seen are well equipped. If you are an EU citizen you’re entitled to healthcare services (you need a healthcare card but it’s easy enough to get). Things like vitamin supplements are more expensive here so stock up or buy online. So, to sum up I’d say retire in Tuscany has a lot going for it as a retirement destination – the weather, the food and wine, the relaxed lifestyle, good services, low crime rate, proximity to home etc On the other hand it’s not an expat resort with a concentrated English speaking community, so you’d have to make the effort to integrate with the locals. If you are thinking about retire in Tuscany consider going there for a short break, get in touch with Jim if you have any questions.